A few weeks ago, a client and I were talking about time management when she brought up the idea of energy management. 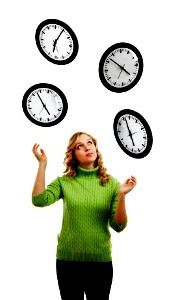 Rather than trying to better manage your time, she said, think about managing our energy. This, I thought, is brilliant. Many of us (including myself) are driven by the clock and manage our lives by it. Wake up at 5:30. Get the kids up at 6:15 and off to school by 7:15. Client call at 8:30. Meeting at 10:00. And so it goes. By changing my thinking from time obsession to an energy orientation, my whole image of a day changed. Rather than it being the face of a clock, all about hours and minutes, my visual is now a red helium balloon. At times, the helium balloon is full and floating high. I need to take advantage of those times. Sometimes, it can begin to lose some of its helium and start to sink. I need to be aware of those times. How can you manage your balloon? Be aware of your personal energy-flow. Are you a morning person? How much time can you be in front of your laptop before you’re lethargic? Does interacting with others give you energy or zap it? Does your productivity peak between 9:00 and midnight? Figure out one energy-building thing and do it every day. It can be very simple. Some people like jokes so they have a joke-a-day calendar. Walking down to the break room with a colleague you enjoy talking to can give you a five minute boost. Taking a quick walk so you can see the fall colors can bring energy back. Tackle tough tasks when you are at peak energy. You’ll have the ability to think more creatively, stay more focused and handle more complexity. Most importantly, have something in your work that fills you with energy. Do a job audit every once in a while. Is your work, overall, energizing you? If not, what would you want more of? What do you need less of in your work? Is it possible to make a change? So change that time paradigm — don’t manage by what time it is, manage by where your energy is.